Rob’s guests are Skylar Bayer (Ph.D. candidate in marine biology at the University of Maine based at the Darling Marine Center in Walpole, Maine, USA) and Bryce Stewart (marine ecologist and fisheries biologist at the University of York, UK). Skylar reveals the truths behind the story of two buckets of scallop gonads lost during a hand-off outside a convenience store on Mount Desert. 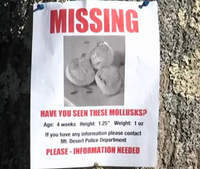 Flyers of missing scallop parts went up and out to media. Journalists from the Colbert Report traveled to the far-flung lobster state and were shocked by what they imaged – an obsessed woman with diabolical intentions to take over the world by doing science from her laboratory. 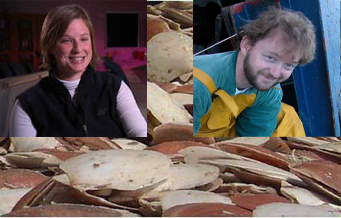 Giant sea scallops and king scallops have much in common, also some very interesting distinctions. Skylar and Bryce describe the life history and survival strategies of surprisingly alert and mobile scallops. We agree that a third species, the little short-lived bay scallops, have the prettiest blue eyes. Watch out, scallops add eyes to their mantle as they grow. Skylar discusses her research into whether scallops that crowd together produce more offspring than do scallops more spread out. Reproductive successes found in more artificial settings may not be the same as what happens in the wild. Skylar offers some reasons why there’ll be times when gonad size is not everything for a population. Bryce explains why young king scallops wear byssus threads to hold onto to high-rise hardscapes. Adolescent scallops loose the threads to become remarkably active, out maneuvering crabs at the click of a claw. Adult scallops settle in to a low-profile couch-potato kegger lifestyle on ocean floors where the sediments are not too fine or pebbles too big. Trouble with the scallop fishery is when dredgers drag outside of their regular scallop grounds onto rocky bottoms, boulder reefs, and maerl beds. Divers fishing for scallops in those areas certainly don’t like the mobile dredgers being on the same patch. Scotland has the greatest number of marine protected areas in Europe. In 2015, urged by ORI’s letter signed by thousands with hundreds of comments, the Scottish Ministry closed about 2% of the scallop fishery grounds. There was much hue and cry at the time. However, by September 2016 the dredgers had sorted it out and no dredger has been put out of work due to the spatial management regulation – and more maerl beds were protected. THE ENEMY WITHIN – DR. SKYLAR BAYER by Kirk Bloodsworth, The Colbert Report 03/04/201 Correction: Skylar is still completing her Ph.D. You are on your own finding the other misstatements. And the Swimming Award goes to the Queen Scallops of Kimmeridge Bay in Dorset (click to see the video). Queen Scallops are smaller and more rounded with curved top and bottom shells than King Scallops with their flat top shells. You’ll never see a King Scallop cutting an ocean floor as well as a Queen Scallop, they are more stately. Defending King scallops of Wester Ros across ocean floors in Scotland’s Marine Protected Areas, see Rob’s blog post from the Highlands.